At 16 feet, Geoffrey is as tall as a real giraffe. 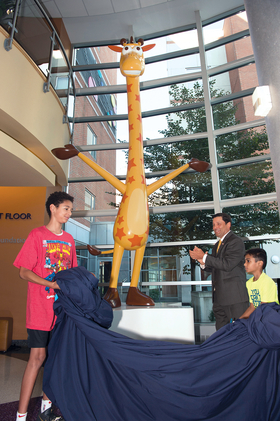 A giant statue of Toys R Us mascot Geoffrey the Giraffe that once adorned the now-bankrupt company's headquarters has found a new home at a New Jersey children's hospital. At 16 feet, the 550-pound statue stands as tall as a real giraffe. In July, it made the 40-mile trek from Toys R Us headquarters in Wayne, N.J., to the lobby of Bristol-Myers Squibb Children's Hospital in New Brunswick. “I simply thought it might be pretty cool for a kid to have their eyes pop wide open when they come into the hospital on what otherwise might be a sad occasion and have a little cheer,” said Ken Rosen, a board member at RWJBarnabas Health, in a video produced by the health system. Rosen helped organize Geoffrey's trek with Joe Malfitano, the liquidation adviser for Toys R Us, who bought the statue and donated $10,000 to ship it to the hospital.